Hi, everyone! Heather P. here, and it's my turn on the Winnie & Walter blog today to share the card I've created using Shades of Spring as inspiration. I love spring, if I had to pick a favorite season, it'd be tied for first place (along with fall). There's just something about the sunshine and all the beautiful colors that pop up during the spring time that make me so happy. To create my card today, I started with a medium gray card base, and adhered a strip of silver glitter CS to the left edge. I then adhered a strip of aqua patterned CS on the left edge as well before adding some silver metallic twine. Next, I stamped the solid flowers and leaves from the Big, the Bold and Extras were stamped in pink, purple and green. Once the inks dried, I stamped the silhouette images on top with versamark ink before heat embossing with white powder. 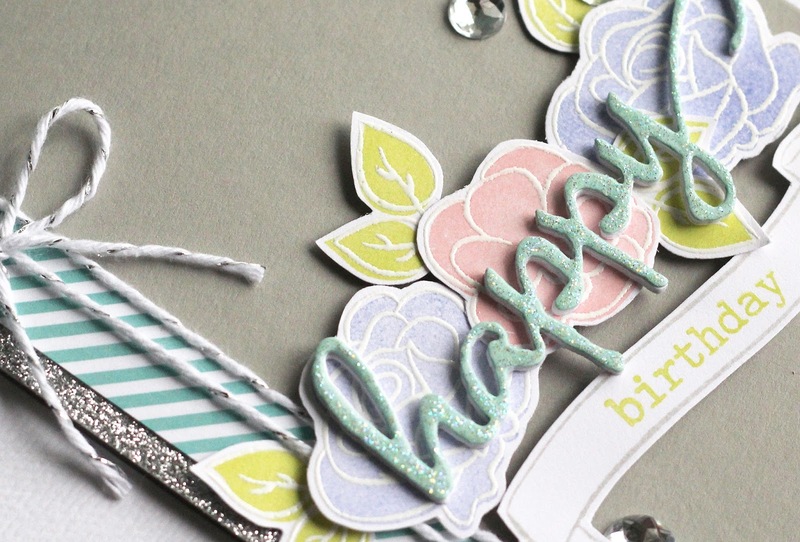 I then stamped the banner from the Big, the Bold and Extras in light gray ink before stamping the birthday sentiment in green ink. Once all the images were dry, I fussy cut them out. 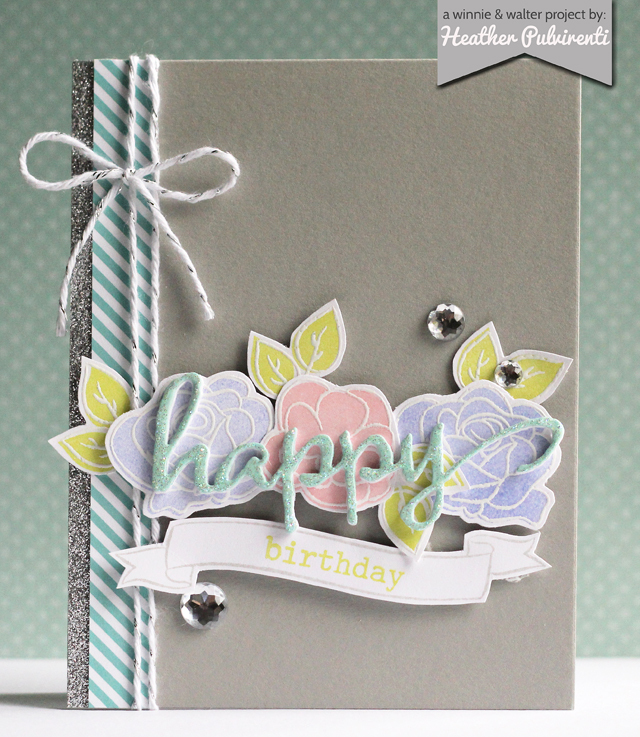 The happy sentiment was die cut from mint CS and white CS using the Big, the Bold and the Happy Cutaways. The die cuts were adhered together, then covered with stickles. While the die cut was drying, I fiddled with the arrangement of my images, then secured everything with pop dots. To finish up, I embellished with clear gems. Heather we love the same seasons... and I love what you've done with these gorgeous W&W blooms!! You've conveyed the shades of spring beautifully on your card with these ever so pretty blooms. Your sentiment - especially the shimmery *happy* - adds such impressive impact. Gorgeous card in every way! So pretty, love all the details. What a beautiful and sweetly created birthday card!! Love the added details of the twine, the jewels and the sparkly silver border!! I think this card is wonderful and so very well done - graceful styling and just so pleasing!!! this is a beautiful card. Love the pastel colours of your roses with the glitter border as an accent. LOVE your flowers & design, LOVE your pretty pastels and splash of sparkle too!! !